In today's world, it's important to have biblical guidance as well as academic knowledge. At Carden Christian Academy in Pensacola, Florida, we offer quality instruction to raise our students to become upstanding citizens in the community. We challenge children and praise every step of progress as they accomplish their educational goals. The partnership between home and school is very important to us, therefore we welcome conferences between our teachers and parents. Carden Christian Academy's offers divinely inspired instruction for children in kindergarten through eighth grade. Our school day begins with a Bible lesson planned to help children understand Biblical truths and how to apply those principles to their own lives. In order to provide a well-rounded educational experience, we assign homework Monday through Thursday, administer regular assessments, and issue report cards every nine weeks to track your student's academic progress. Well-trained professional teachers lead classes and mentor children through the academic day in these subjects. 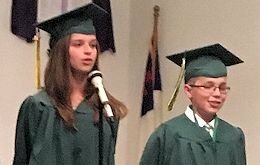 We celebrate the achievements and promotions of our students with graduation programs, complete with caps and gowns for those completing kindergarten and eighth grade. In order to abide by proper Christian principles, Carden Christian Academy enforces a strict uniform dress policy. The administration reserves the right to change or modify the dress code as appropriate. If a student is not dressed appropriately, parents will be contacted to bring a change of clothing or pick the student up from school. Black rubber-soled shoes and white socks are worn (sneakers for P.E.). Middle school students must wear PE uniforms during PE. No painting, writing, or tattoos on body parts. Polo shirts (gold, navy blue, pink, white or hunter green) will be worn daily. Skorts or skirts should be knee length or longer. Shorts must be worn under skirts. No body piercing except for one pair of studs/posts earrings in the ears. Polo shirts (gold, navy blue, white or hunter green) will be worn daily. Boys must wear belts fastened at the waist with their shirts tucked in. Hair must be of reasonable length not extending over the collar/ear. No fighting characters such as Ninja Turtles™, Transformers, wrestling personalities, sexually suggestive images or words, inappropriate language or pictures on any clothing or advertisements of alcohol or tobacco should be on any outer garments (sweaters, jackets) or book bags. All uniforms must be purchased through Zoghby’s Uniform.